Rose Ngoka is a young lady who is struggling to transform her life by exploring different opportunities that comes around. She is 23 years old with college background employed in a certain Organization but for her depending on monthly salary she cannot fulfill her basic needs and accomplish her dreams. Wherever she sees an opportunity she make use of it without considering if she can or not, what she believe is that, she can if she get training and be ready to act on the issue. She is a SUGECO farmer who is cultivating Orange Fleshed Sweet Potato (OFSP) in a quarter acre of SUGECO farmland in Morogoro. She likes to encourage other youths to fight for life regardless of educational background that someone has. For months, she has been working with Kathleen Novelia who is a Food Preservation and Processing Specialist, a UNITERRA volunteer from Canada in making different dried fruits. This started off with her offering help to Kathleen as she saw the amount of different fruits she was processing. 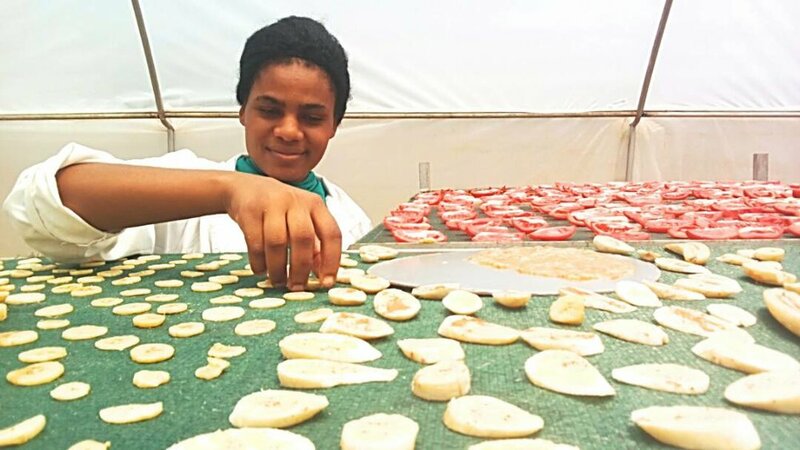 The simple gesture turns into a complete training that finally enables her to now process her own dried fruits and establish her micro enterprise, called Amani: Premium Dried Fruits. By using solar dryer facility at SUGECO she learned on how to dry fruits without losing its nutrients and minerals, along with different techniques on manipulating fruits. So far, she is drying tomatoes, jackfruits, pineapples, plums, pears, bananas, mangoes, and sweet potatoes. She is also making fruit leathers from Kathleen, which is another type of dried fruits that requires a good amount of techniques in order to make it. Many people have been amazed by the texture and taste of the fruit leather since is the new product that most of Tanzanians are not aware of. Through the help and support she received, she has started to meet with clients in Morogoro. Apart from that, Rose Ngoka has started her contribution in the society since the fruits she is drying she buys from the small holder farmers in Morogoro. By doing so, she is stimulating the fruits market and reducing post harvest losses. Her dream is to have a big enterprise for fruits processing and to become a business woman in sector of fruits. Meet a young entrepreneur Ray Peter Mark from Dodoma-Tanzania who has received support from SUGECO. His big dream in agriculture to feed the world is now coming true. His parents used to send him to farm early in the morning before going to school and during the weekends, which is where he developed his spirit and ambition to work in agriculture. He has achieved a lot although it was not easy for him to start agribusiness. He started with by promoting agriculture by establishing demo farms in his secondary school and village. ‘‘Farming in an open field gave a low yield while requiring a tremendous amount of effort. Now that I am using the greenhouse, I am able to save 40,000 shillings per week after our household expenses’’. At the beginning, Ray Mark was cultivating crops in the open field where the crops were more susceptible to diseases, pests, and birds. Water consumption for irrigation in open field was also significantly higher than it is in greenhouse. By using the greenhouse, he is able to make more profit under the same amount of time. In six months, the yield increased from one tonne in open field to seven tonnes in greenhouse with less labour force. He became a champion farmer in his village and Dodoma as a whole. He is now producing quality products due to a better pest management system in the greenhouse whilst using a lower production cost than open field. Through greenhouse project he has been able to get in to different network around Tanzania. He is a trusted young man sent by the government officials to teach other youth around Dodoma area through workshops to value agriculture as a business and to grasp opportunities in other sector. He has been getting many visitors from different places to learn about horticulture. Moreover, he is now able to open small cement blocks industry, to have electricity service at his home, and to provide employment to other youth. He is now supplying vegetables and other crops like tomatoes, okras and eggplants to the supermarkets and hotels in Dodoma. Through his achievements from this SUGECO-supported greenhouse, the Ministry of Youth has granted seven million shillings for him to establish another greenhouse.